"In Japan, smiling, dancing animals, mutated foodstuffs and saucer-eyed humanoids promote every conceivable thing, from out-of-the-way tourist spots to careers in the military. Some of these figures have huge followings on Twitter and earn billions of yen in revenue. At least one has met the emperor. "We have a motto, which is that there's no human inside," said Hiromi Kano, whose family runs Kigurumi.biz, the foremost mascot-outfit maker in the country. The company's suits, which cost $4,000 to $6,500, are the Mercedeses of the mascot world. But yet, Hiromi told @nytimes, she did not set out to create a cuteness empire. 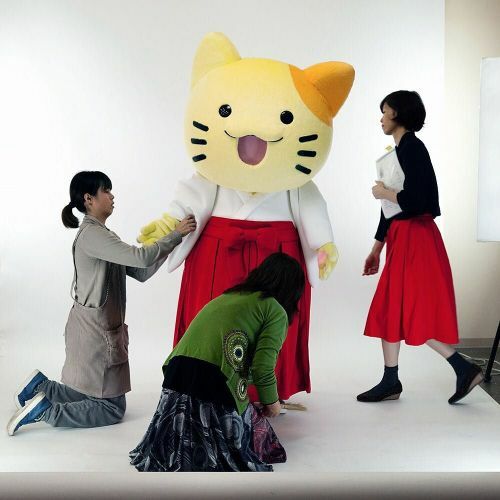 Ko Sasaki photographed workers tending to a mascot before a photo shoot at the Kigurumi.biz factory in Japan." By nytimes on Instagram.